For the first time since Justice Brett Kavanaugh was confirmed to the Supreme Court, Chief Justice John Roberts opened up about Kavanaugh's confirmation process. 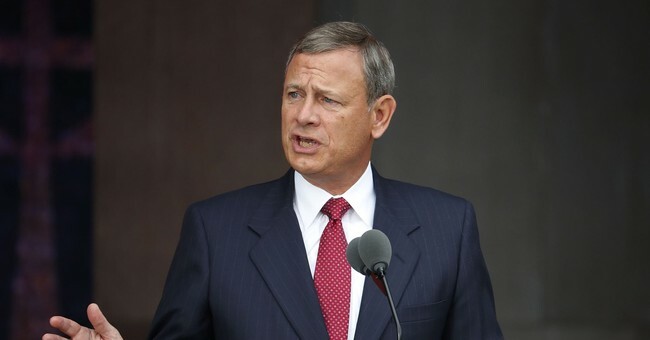 At an appearance at the University of Minnesota on Tuesday, Roberts vowed to keep the Supreme Court out of partisan political politics, despite a very partisan recent confirmation process, POLITICO reported. “As our newest colleague put it, we do not sit on opposite sides of an aisle. We do not caucus in separate rooms. We do not serve one party or one interest. We serve one nation. I want to assure all of you that we will continue to do that to the best of our abilities, whether times are calm or contentious,” Roberts said. Roberts reminded the audience that politicians speak for the people who elected them but the Court does not. The Court's soul purpose is to be independent and unpartisan. "I have great respect for our public officials. After all, they speak for the people, and that commands a certain degree of humility from those of us in the judicial branch who do not," Roberts explained. "We do not speak for the people, but we speak for the Constitution. Our role is very clear," the chief justice said. “I will not criticize the political branches. We do that often enough in our opinions. What I would like to do is emphasize how the judicial branch is and must be very different." He was also very clear about one thing: the Court has previously made landmark decisions that weren't popular with politicians at the time but had a lasting impact on our nation. Those decisions were made because of the Court's impartiality. Roberts stressed that many of the Supreme Court’s most significant decisions had been unpopular and at odds with what elected officials of the time probably would have wanted. In particular, he referenced Brown v. Board of Education, which desegregated schools; West Virginia State Board of Education v. Barnette, which protected a student's right to refuse to say the Pledge of Allegiance; and Youngstown Sheet & Tube Co. v. Sawyer, which reigned in presidential power when President Truman tried to seize steel mills. Although the Court is located in Washington, D.C., in the heart of the political realm, the justices have practices they partake in to try and do their job in a "collegial way." Justices will shake hands before a conference or before taking the bench, the Star Tribune reported. They also eat lunch together and discussing cases is prohibited. One thing that Roberts hinted at, according to POLITICO, is that justices will sometimes talk politics behind closed doors, mostly because it's unwise for them to discuss their political ideologies with others. The chief justice still has a long-stated goal: having stronger majority decisions, as opposed to 5-4 splits. Broader decisions make it more difficult for justices to come to a consensus and agree. "I still think it's an important objective because judicial decisions should be narrower rather than broader," he said.